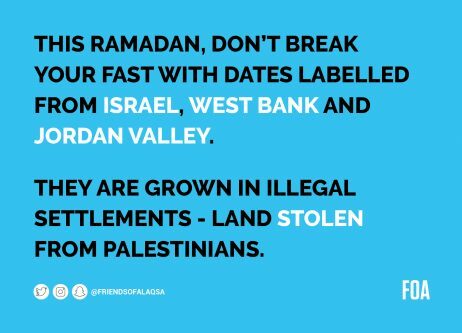 Avoid dates labelled from Israel, West Bank and Jordan valley as they’re grown in illegal settlements on land which had been stolen from Palestinians. 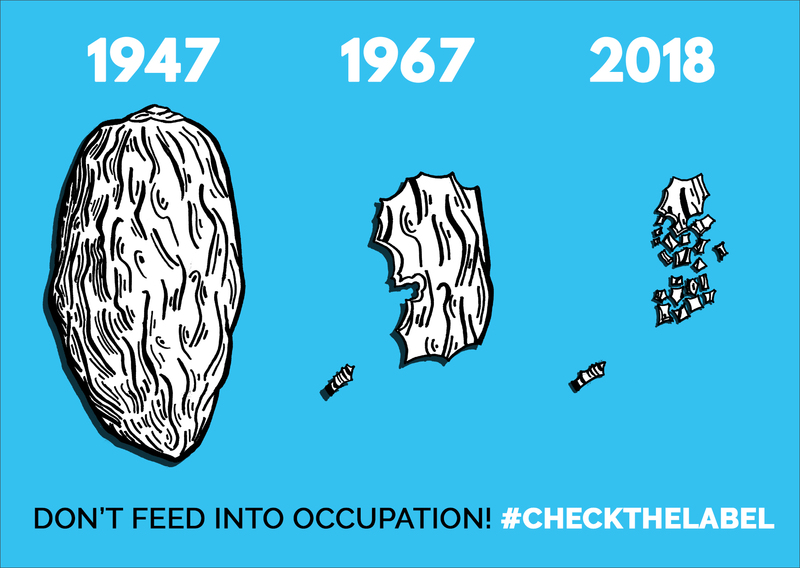 Dates labelled from Israel, West Bank and Jordan Valley are grown in illegal Israeli settlements, on land which has been stolen from Palestinians. 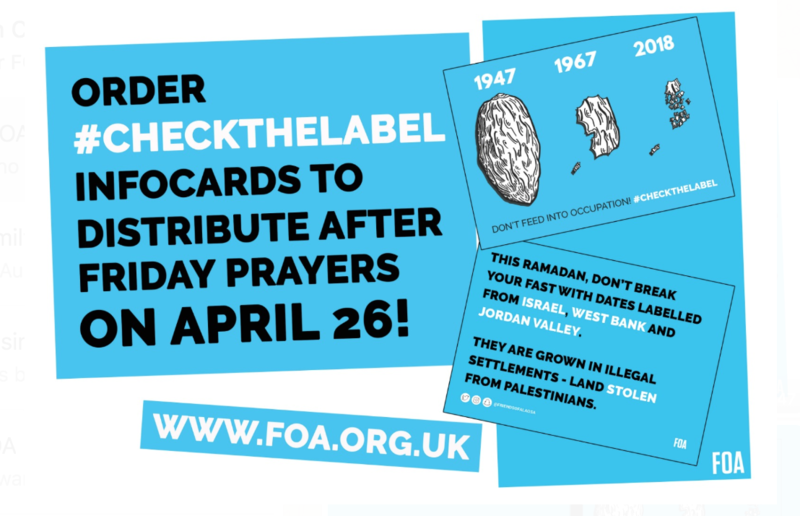 Let people know how to boycott Israeli dates by distributing #CheckTheLabel info-cards outside your mosque after Jummah on April 26. (For UK distribution only). Email info@foa.org.uk with your name, address and number of info-cards required. #CheckTheLabel of dates when shopping. 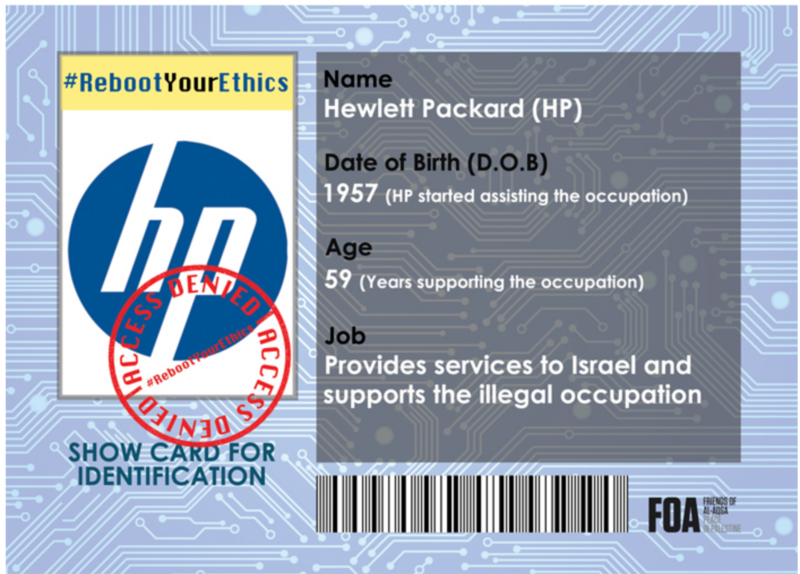 Don’t buy dates labelled from Israel, West Bank and Jordan valley. What Fruit and Vegetables should I look out for? Seasonal fruits and vegetables such as dates, citrus fruits, peppers and avocados. Is it only Fruit and Vegetables I need to check the label for? No. You also need to #CheckTheLabel of manufactured products including cosmetics, carbonation devices, plastics, textile products and toys. Won’t Palestinian farmers lose their jobs? Palestinians themselves are calling for a boycott of Israeli products. Disregarding their call goes against the demands of a community facing an oppressive occupation. What is the aim of the boycott? As we saw with apartheid South Africa during the 1980s, boycotting served as an effective strategy to highlight injustice and to ultimately build up pressure on the South African government. 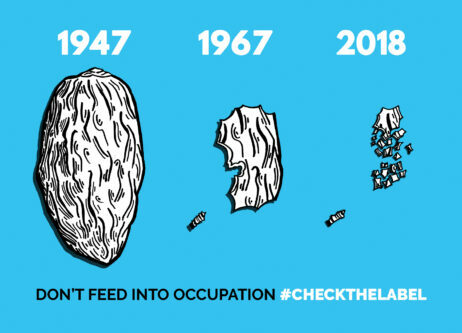 The #CheckTheLabel boycott is aimed to pressuring Israel to lift its illegal siege of Gaza, end its occupation, end its illegal settlement programme and answer the charges that Israel has engaged in war crimes against the Palestinians. How does not buying an avocado make a difference? 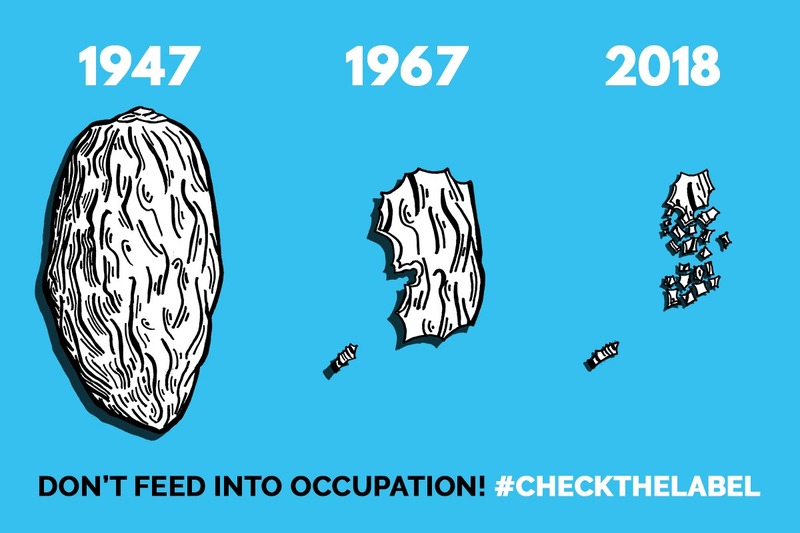 By not buying produce from Israel, the illegal settlements in the West Bank, or in the Jordan Valley you are making a stand supporting the Palestinians. By boycotting you are putting international pressure upon Israel to end its brutal occupation and to ensure it complies with international law in a peaceful way. It is making a difference. Israel is spending millions of pounds countering the boycott, as it knows the boycott focuses on its grave violations of international law and injustice towards the Palestinian population. How will a boycott of Israel help? 1. It reduces their income as companies stop trading with Israel. 2. 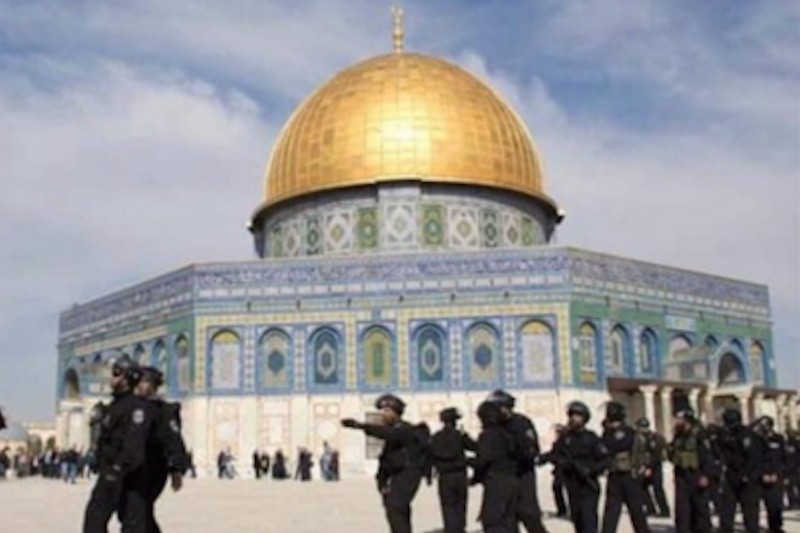 It isolates Israel by rejecting it from the rest of the democratic world by exposing it as a false democracy, wherein there is only freedom for one people and oppression for another. 3. It pressurises Israel to change its inhumane policies in Gaza and release it strangle hold in the West Bank. 4. 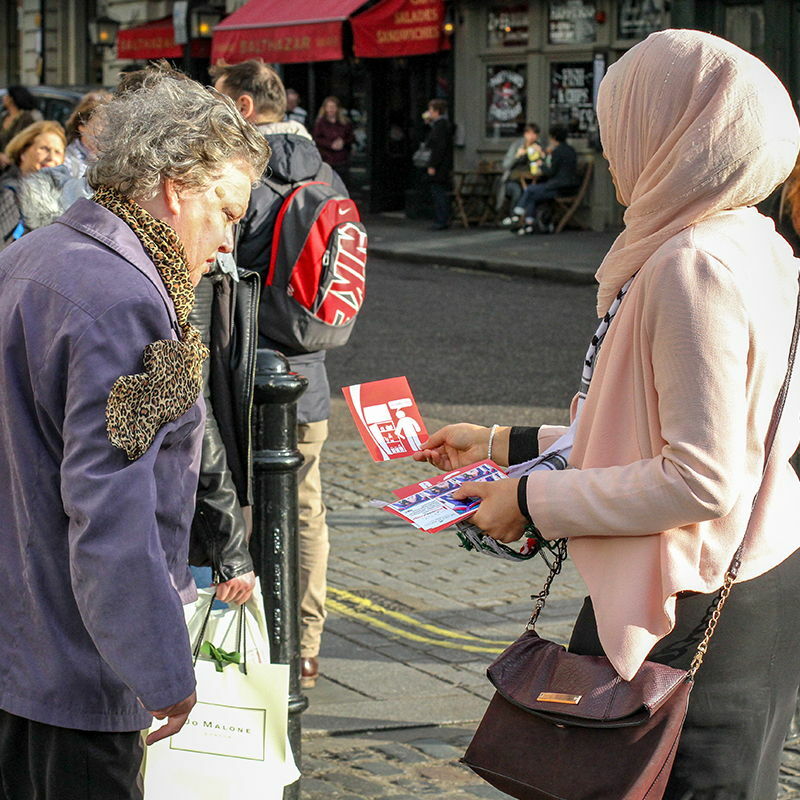 As world governments clamour to support Israel and its ‘right to defend itself’ while ignoring the relentless Israeli aggression and wanton violence against Palestinians, ordinary people like us can make a huge difference. Through boycott, we isolate Israel and send a clear message that the global grassroots communities will not stand by and do nothing while Israel murders innocent Palestinian women and children.